The new Black Butler anime has been greenlit, and it could continue adapting parts of the original manga. A new Black Butler anime series has been greenlit, according to the cover of the February issue of Square Enix's Monthly GFantasy. 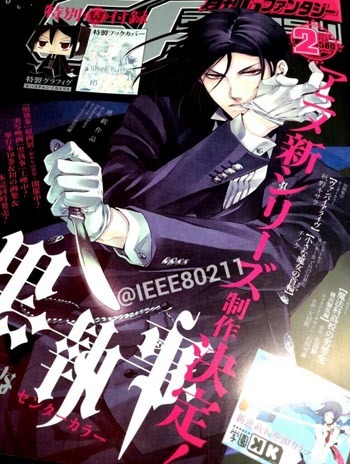 The cover depicts Black Butler character Sebastian Michaelis. Details about the new series have not been released. A Twitter user published a picture of the cover, offering an early look at the announcement scheduled for Jan. 18. Meanwhile, a live action film adaptation of Yana Toboso's manga Black Butler will open Jan. 18, and the 18th volume of the manga will ship in Japan. The supernatural fantasy series takes place in Victorian era London where a young earl named Ciel solves crimes with the highly skilled butler who is actually a demon named Sebastian. Ciel is on the hunt for the people who killed his parents and set the manor on fire. He offers his soul to Sebastian who in turn promises to help him achieve revenge. The manga began serialization in Monthly GFantasy magazine in 2006, and the first anime series aired in 2008 with a second series airing in 2010 with new characters, Alois Trancy and Claude Faustus, designed by Toboso. The manga far outreaches what the anime has covered, so there's plenty of original material for the anime to adapt.